Calendar of Acts pass'd this Session. Acts made in the Parliament holden at Westm. the First Day of March, Anno Septimo Edwardi Sexti, and there continued until the last Day of the same Month, Anno dicto. AN Act of a Subsidy and two Fifteenths and Tenths, granted to the King's Majesty by the Temporalty. An Act for the true Fulling and Thickning of Caps. An Act for Confirmation of a Subsidy granted by the Clergy. An Act reviving a Statute made Anno 17° Edwardi Quarti, touching the Carrying of Gold and Silver out of the Realm. An Act for the true answering of the (fn. 1) King's Majesty's Revenues. An Act for the uniting and annexing of the Town of Gatesyde to the Town of Newcastell upon Tyne. An Act to make Denizens the Children of Richard Hill and Nicholas Whelar. 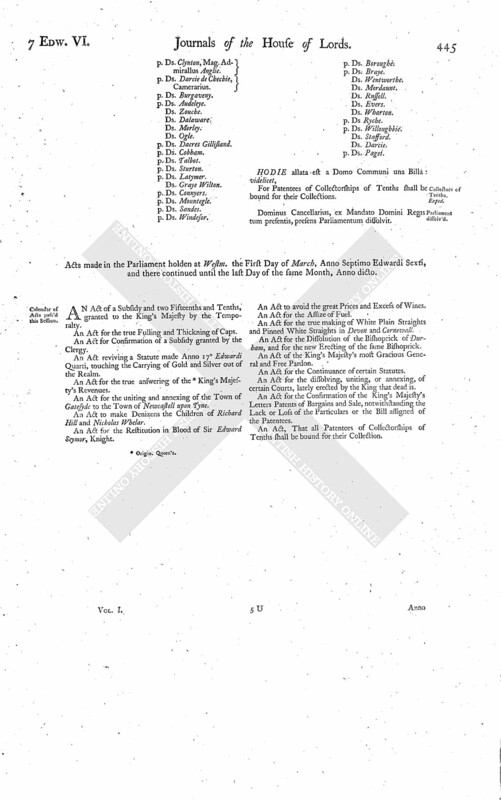 An Act for the Restitution in Blood of Sir Edward Seymor, Knight. An Act to avoid the great Prices and Excess of Wines. An Act for the Assize of Fuel. An Act for the true making of White Plain Straights and Pinned White Straights in Devon and Cornewall. An Act for the Dissolution of the Bishoprick of Durham, and for the new Erecting of the same Bishoprick. An Act of the King's Majesty's most Gracious General and Free Pardon. An Act for the Continuance of certain Statutes. An Act for the dissolving, uniting, or annexing, of certain Courts, lately erected by the King that dead is. An Act for the Confirmation of the King's Majesty's Letters Patents of Bargains and Sale, notwithstanding the Lack or Loss of the Particulars or the Bill assigned of the Patentees. An Act, That all Patentees of Collectorships of Tenths shall be bound for their Collection.